I think it is about time to admit – my son Miles speaks better Chinese than me now – just a bit over 2 years old now and he really dominating the conversations now. I’m trying my best to keep up…I’ll keep you posted if it changes. And Chris davey told me Xero accounting is now connecting with a Singapore bank – yet still no HK banks. Which is unfortunate as most Amazon sellers use Xero for the A2X accounting integration – which automatically pulls in your data there. Guess we will have to wait. 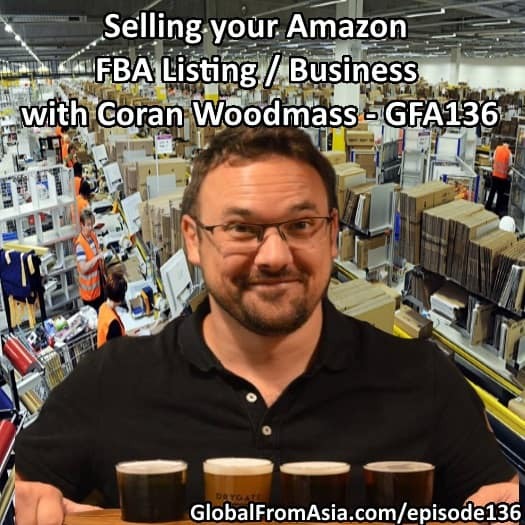 Ok, and speaking of Amazon sellers – today we have a treat- Coran Woodmass is on the show giving some massive value bombs on how you can sell your FBA business for decent returns – as well as a special offer to help listeners out – so let’s listen in. We caught up at DC Barcelona, as well as in your current base of Prague – great to have you on the show Coran! So you are a broker – specializing in FBA listing sales. This seems like a new thing – how did you get into it? Can someone really sell their Amazon account? What attracts buyers to this kind of business, the Amazon FBA model? What are some of the things buyers are looking for in Amazon FBA businesses? How does supply chain come into play here? We at Global From Asia talk a lot about Chinese factories and Asia business – is there a pro or con if your FBA supplier is based in China versus a “home market” supplier? Does it matter if the seller is located in China, Hong Kong, USA, Europe? Does location of seller matter, or where they registered the company (maybe that is 2 different questions). How long would the typical process start? Is it a business that is being sold, or an asset, an account? And then once the transfer is complete, how is the transition period? Can you share some recent examples of a transaction. Of course you don’t need to disclose client names, products, etc but this would help people get their heads around it. So listeners interested in buying or selling – you’re the guy to talk to? How can they reach out or take next steps? Thanks so much Coran! That is it for today – thank you for listening all the way to the end of the show. Should I keep doing these small outro clips at the end? Well, thanks for waiting and take up Coran’s offer of a free call for your FBA business head on over to thefabroker.com/global and take advantage – tell em Mike sent ya – he’ll take care of ya! Summer is almost over! And we are back on weekly podcast schedule – next week, man, I gotta decide which show to put on – I have about 8 shows already in the hope and just need to decide which one to push out first. TOns more interviews too and upgrading my mic setup as well. Loving this stuff, and if you want to support , feedback, itunes reviews, bribes – they all work. Take care enjoy your week and keep on being global!